The Russian Orthodox Church has launched a music channel to serve as a virtuous Christian alternative to dozens of other such networks on Russian television, the Church said in a press release this week. Wednesday's programs on the channel included an emission about sacred choral music and another in which an elderly priest sang and played guitar while a young woman in a long dress with flowing hair played a dulcimer, a folk instrument. The channel MuzSoyuz began broadcasting online in January and was launched as an Internet channel for smart TVs over Easter. It is planned to be launched later on cable and satellite television, the Moscow Patriarchate said Tuesday on its website. MuzSoyuz is part of the Church's Russian-language Soyuz ("Union") network run by the Church's Yekaterinburg Eparchy. Soyuz, which is celebrating its 10th anniversary this year, is one of several Russian Orthodox networks that have sprung up in the past decade as the Church experiences a significant resurgence in the post-Soviet country. After decades of repression under the officially atheist Soviet regime, the Church has developed an increasingly close relationship with the Kremlin in recent years. 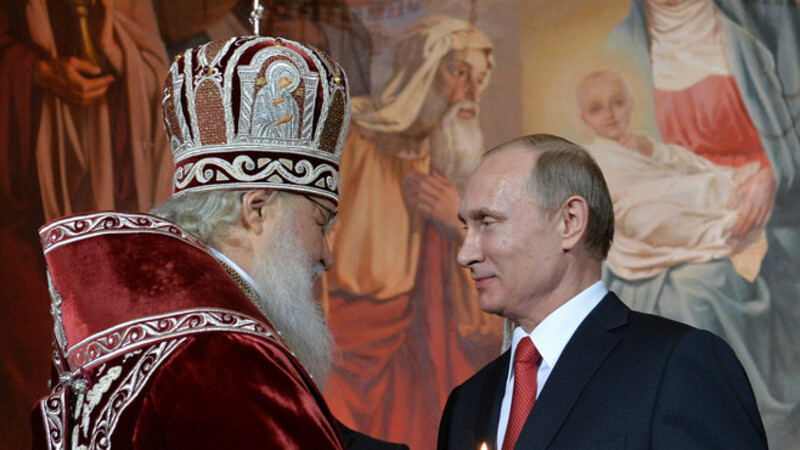 Shortly before the election in 2012 that saw Vladimir Putin return to the presidency, Patriarch Kirill, the head of the Orthodox Church, described Putin as a "miracle from God." Despite the official separation of Church and State, the Orthodox Church has received staunch support from the federal government in recent years, including a controversial 2013 ban on insulting the sentiments of religious believers, as well as funding for theological projects that promote national identity. The first Russian Orthodox animated feature film to be released in theaters nationwide will premiere next month, after being made possible by funding from the Culture Ministry, state media reported this week. "Serafima's Extraordinary Journey," about a young girl influenced by one of the most revered saints in Eastern Orthodoxy, St. Seraphim, aims to "awaken" the holy spirit in Russians around the country, state news agency RIA Novosti reported, quoting the movie's producer Igor Meshchan. In a high-profile scandal earlier this year, a representative of the Orthodox Church complained about the use of religious imagery in a production of the Wagner opera "Tannhauser" at a Novosibirsk theater, prompting prosecutors to investigate the opera's director for insulting the feelings of religious believers. Though a court threw out the case against the director, the head of the theater was then sacked by the country's culture minister anyway, who cited his failure "to take into account values that exist in society." Last week a prosecutor in the Urals city of Perm was quoted in state media as saying that a graffiti artist who painted a mural of the first man in outer space — Soviet hero Yury Gagarin — crucified on a cross would face up to a year in prison for insulting religious believers.